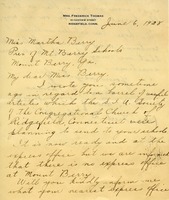 Mrs. Thomas writes that she needs an express office where a barrel of useful items collected by the S. I. U. Society of The Ridgefield Conn. Congregational Church can be sent because Mt. Berry doesn't have an express office.